I wasn’t planning on reviewing this book, I wasn’t actually sure that I was going to like this book. It was recommended to me by a friend of mine and is the first in a paranormal/urban fantasy series. When I first took a look at this, like I mentioned before, I wasn’t sure. It’s about vampires and werewolves in Victorian England, the cover is VERY pink, and I had heard that there was a good amount of ‘adult fun’ in it – so I was pretty worried that this was just going to be another Twilight or, rather, 50 Shades of Grey… which I was not the least bit interested in. BUT, I must say, I was wrong. Very very wrong. This book is a lot of fun and I am really glad that I picked it up! 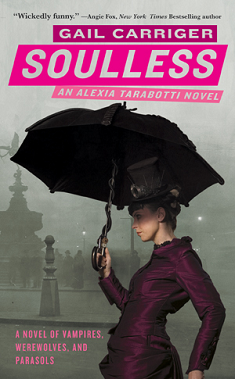 Alexia Tarabotti is a soulless preternatural spinster living with her mother, stepfather and half-sisters in Victorian London. This is not the Victorian London we remember, but rather one where vampires and werewolves and ghosts all live out in public and, for the most part, tend to be pretty elevated in society. Miss Tarabotti is not your typical Victorian spinster either. Being a preternatural means that whenever she physically touches anyone of the supernatural persuasion, they become mortal for as long as there is physical contact. Added to her soullessness, Miss Tarabotti is an independent, intelligent, well read, cake loving, loud mouthed girl, who although is not totally ok with being a spinster at age 26, would rather that then being a simpering maiden married off at the earliest convenience. Soulless starts rather dramatically, with Alexia inadvertently killing a rogue vampire and ruining some much anticipated treacle tart. Coming to her rescue is the devilishly handsome Lord Maccon, the alpha werewolf of the Westminster pack and ranking member of the BUR, which is basically Queen Victoria’s internal supernatural police force. Right from the beginning there is an attraction between Alexia and Lord Maccon, the only problem is that neither of them see it for what it is; until a little bit later in the story, that is… and then they see it quite well (if ya know what I mean!) The story so far is going quite predictably; Alexia is a woman ahead of her time and aches to be allowed the freedoms of men, so gets herself involved in the mystery of the rogue vampire, gets herself in trouble and gets saved by the estimable alpha. It seems that strange vampires and werewolves keep appearing and known vampires and werewolves keep disappearing and no one has any idea why…. Except for maybe the mysterious stranger who has tried to abduct Alexia on at least one, possibly two occasions. In another review I saw someone say that if Jane Austen and PG Woodehouse collaborated on a novel, this would be it and I can’t help but agree with him. The novel is highly satirical; it’s no holds barred making fun of proper Victorian society. I think that I can honestly say that I was not expecting this book to be as well written as it is (that is not a comment on Ms Carriger AT ALL. I am pretty weary of anything this popular, which is really a comment on society at large) It may be gitch and fun, but I have really been able to feel what the characters are feeling; Alexia’s yearning to be freer, and maybe a little bit prettier, but recognizing her own value in a society full of vacant women; Maccon’s confusion and embarrassment at his ineptitude with Victorian social norms, while at the same time his confidence that it doesn’t really matter. The primary characters are all well rounded and ‘human’ and the secondary characters aren’t just cut outs either. Some notable examples are the hilarious, incredibly flamboyant vampire, Lord Akeldama, and Ivy Hisselpenny with her Victorian sensibilities and outrageous hats, Alexia’s friends and sounding boards. Carriger has done a brilliant job of combining a bunch of different genres and producing a witty and fun coherent novel. There are elements of urban and paranormal fantasy, steampunk, romance, and thriller; just enough of each of not too much of any. I am looking forward to reading the rest of this and seeing where Alexia and Maccon’s relationship goes (sometimes I really am a sucker for a good love scene) and also figuring out just what is happening to the supernaturals in London town. I had a hard time coming up with a tea for this book... I wanted to think of something fun like the book. I have ended up choosing a new tea that I just got from Teavana - Strawberry Cream White Tea. Its absolutely delicious and better yet, its pink!